My good friend told me about this book he was reading. Every week when we met he would talk about how amazing the book was; so obviously I bought it. In the first Chapter Bob caught my attention with his unique ability of story telling. Honestly, I didn't believe what he wrote to be true. I thought to myself: "there is no way anyone lives like this." As I kept reading it became clear that Bob Goff lives like that. Bob shares some great stories about how people impacted his life for Jesus and how he, in turn, has impacted others life's for Jesus. The book is so good Charity ended up reading it to me while we had a get-a-way to Tahoe a few months ago. Bob's stories have encouraged me to live more "open handedly". Growing up in a home where money was tight I've constantly struggled with money. 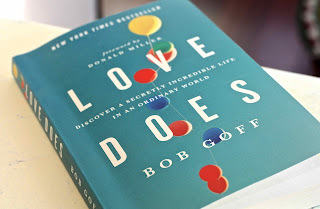 After reading Love Does I'm leaving more encouraged to be the person God has called me to be, to be more open handed in life and to be ready to go on the adventures God has put right in front of me. I'm not going to be perfect but I'm sure going to keep my eyes open to be a part of what God is doing around me! I can't give you too much but I can encourage you to buy the book, read it and then let's have a coffee and talk about it!